Ensure you and your company are comfortable by welcoming this power motion sofa into your home. 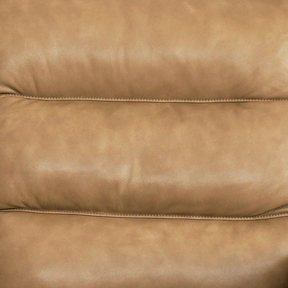 With its leather match upholstery, plush appearance, and pillow top arms, you'll love this piece's casual design. You'll love the way you can control its power headrests and footrests independently using the four separate power control buttons on each of its sides too. Plus, both of its power mechanisms come equipped with a built in USB port, providing you and your friends and family with a truly convenient and relaxing experience. The Regency - Club Level Leather Match Power Motion Sofa with Power Adjustable Headrests by Bassett at AHFA in the area. Product availability may vary. Contact us for the most current availability on this product. The Regency - Club Level collection is a great option if you are looking for Casual furniture in the area.